Emma in Bromley: The One Where Pinterest Noticed Me as a Pinning Super Star! The One Where Pinterest Noticed Me as a Pinning Super Star! Its no secret that I love Pinterest, I really do, I'd go as far as to say addicted ... really! I find myself pinning loads of wonderful ideas all the time and we moved into our "forever home" in July so I'm really keen to find some time to explore some of the ideas I've pinned - as with most mums, I'd say the boards for my kids are the ones I use most. My pin boards are pretty much all about family and home - whether it be about cake, home decorating, photography, creating a fairy garden or handy tips with a teeny bit of fashion, online marketing and blog hints thrown in - not to forget the secret boards for all my birthday and Christmas shopping! 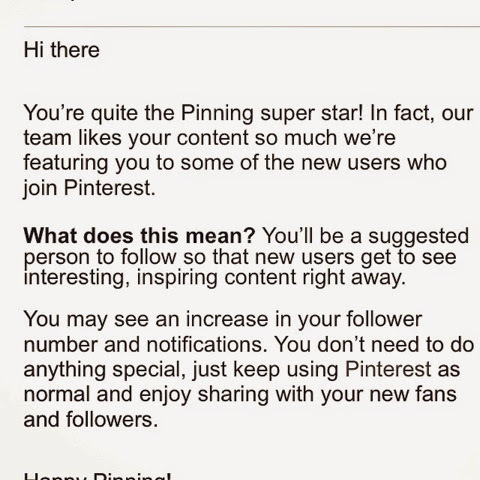 I was absolutely over the moon to get an email from Pinterest identifying me as a "Pinning super star" there was just something lovely about being noticed for all my hard pinning! Are you on Pinterest too?